SeaRAM is an anti-ship missile defence system developed by Raytheon. The SeaRAM missile defence system is equipped with the latest rolling airframe missile (RAM). The SeaRAM missile defence system is an evolution of the MK15 Phalanx close-in weapon system (CIWS). SeaRAM was first deployed on the US Navy’s LCS-2 combat ship in 2009. Image courtesy of Richard J. Stevens, U.S. Navy. SeaRAM is an anti-ship missile defence system designed and manufactured by Raytheon. It offers improved ship self-defence and extended keep-out range capabilities in hostile combat environments. The weapon system allows naval vessels to effectively engage high-performance, supersonic and subsonic threats including sea-skimming, anti-ship missiles, high-speed incoming vessels, rotary and fixed-wing aircraft, helicopters and other surface targets. SeaRAM is an evolution of the MK15 Phalanx close-in weapon system (CIWS), which entered service in 1980. Raytheon received a $136.2m contract from the US Navy in September 2013 for the production of four SeaRAM missile systems and upgrade of 19 Phalanx CIWS. The contract also includes a $94.8m option for an additional four SeaRAMs and 12 Phalanx systems, to be delivered through 2014. Raytheon delivered an engineering model of the SeaRAM anti-ship missile defence system to the UK’s Royal Navy for suitability testing in 2001. Raytheon and the US Navy conducted test-firing of four blast test vehicles for measuring launch forces of the weapon system in late 2001. Raytheon received a $6.7m modification to an existing development contract from the US Navy in December 2002. The missile system was built at the company’s Louisville plant and the first development model was unveiled in August 2003. "SeaRAM is an evolution of MK15 Phalanx close-in weapon system (CIWS), which entered service in 1980." A SeaRAM missile defence system was delivered for deployment aboard the US Navy’s littoral combat ship USS Independence (LCS-2) in March 2008 and was first deployed on the hangar roof of the LCS-2 ship in 2009. In May 2010, SeaRAM completed two blast test vehicle launches from the USS Independence to validate the structural integrity of both the weapon system and the ship. The US Navy awarded a $57.8m contract to Raytheon for the manufacture of two SeaRAM missile defence systems and upgrade of nine Phalanx CIWS systems in May 2012. The company will also supply 20 radar upgrade kits. The missile systems were also deployed on other Independence-class littoral combat ships and the USS Coronado (LCS-4) of the US Navy and the Izumo-class helicopter destroyer of the Japan Maritime Self-Defense Force (JMSDF). The low-risk SeaRAM anti-ship weapon system can be fitted to any class of ship and is designed to offer superior protection for marines and ships. The system is fitted with the same above-deck system and mechanical hardware as Phalanx CIWS and requires minimal shipboard changes. The above-deck system weighs 16,901lb. The SeaRAM close-range protection weapon system is equipped with a latest rolling airframe missile (RAM) guided-missile weapon system. RAM provides superior accuracy, extended range and high manoeuvrability. 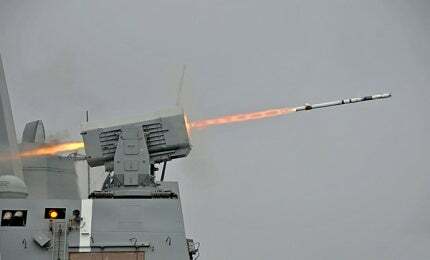 The SeaRAM self-contained system also employs Phalanx Block 1B CIWS’ high-resolution search and track radar and electro-optical sensor suite, which provides the RAM missile with reliable radio frequency, infrared (IR) detection and tracking capabilities to defeat both air and surface threats. The Phalanx CIWS is designed to defeat anti-ship missiles, and other close-in air and surface threats. It is armed with a M61A1 Gatling 20mm gun system and is guided by rapid-fire, computer-controlled radar. It automatically performs search, detection, acquisition, tracking, engagement, and threat evolution of enemy threats and offers protection to ships, and has a range of about one mile. "The Phalanx CIWS is designed to defeat anti-ship missiles, and other close-in air and surface threats." The advanced Phalanx Block 1B CIWS is the new upgrade to Phalanx CIWS. It is fitted with advanced infrared sensor and optimised gun barrels. It also uses new control stations with situational awareness to provide operators with visual target tracking and identification before engagement. The RAM lightweight, fire-and-forget missile is designed to provide quick response and superior protection for naval vessels. It is equipped with infrared guidance and autonomous dual-mode passive radio frequency (RF) system, and requires no shipboard support after launch. It is capable of destroying anti-ship missiles and can be launched from the MK44 guided missile round pack (GMRP), coupled to the MK49 guided missile launching system, housing 21 missiles. It also offers high firepower and multiple simultaneous engagement capabilities. The variants of RAM missile include RAM Block 1, Block 1A and Block 2. The Block 1 platform is equipped with a new image-scanning seeker with an autonomous IR all-the-way guidance, while the Block 1A is fitted with additional signal processing features. The RAM Block 2 configuration incorporates a larger rocket motor, an advanced control section and an improved RF receiver.